I remember myself during my early Forex years, sitting on a bunch of positions across five or six currency pairs and thinking — how do I make them all close at once when their total profit reaches my target? Now, I have developed a tool that does exactly that. 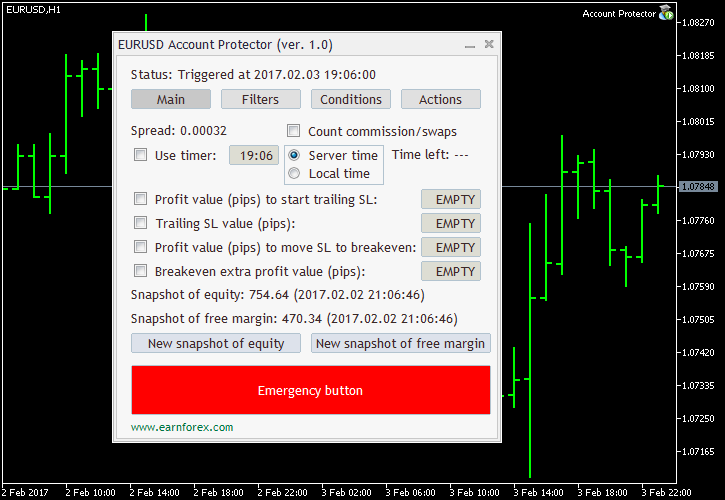 I am pleased to announce the launch of what I believe to be one of the most productive and efficient instruments for MetaTrader platform — Account Protector. Have you ever found yourself in a situation when you want all trading cease at the close of the NY session but with no possibility to sit until that time in front of your computer? This is just one of the cases were Account Protector would be handy — you could simply set it to close all trades at 17:00 and that’s it. I had started to work on this expert advisor back in May 2016. It was the project that kept me from working on some other interesting ideas during the time even though I have hired another MQL4 coder to help me with the panel (a talented guy who, unfortunately, wrote quite unreadable code). A lot of time and resources has been spent on Account Protector, but I hope that it was worth the effort and that it will save a lot of time (and money too!) for its users. Of course, I may be wrong about it, but I believe that Account Protector surpasses similar paid tools in its usability and reliability. If you find some paid tool feature that you would like to see implemented in AP — please let me know. Needless to say that the EA’s open source code means that it is ready for further development and enhancement. However, I would like to make it clear that the panel is quite balanced right now — adding extra features just for the sake of adding them is not a good idea; they have to offer some real improvement to traders’ experience. If you find any bugs in this control panel for MetaTrader or if you have some cool ideas to improve it, please post them using the commentary form below.